What a surprise it was to find a Spider on Jagged Edge reef. Thanks to Koos who pointed it out and also found another smaller one. We are so lucky to dive unspoilt reefs with so many creatures on them. After more than 2 years of diving on the same reefs new things are still found on almost every dive. On both days we dived Discovery Channel due to almost no swell, warm water and great viz. Heidi and Jaco who joined us on their discover scuba dive saw a nice 2,5m raggie, loads of fish life, nudi's, anenomy etc just to name a few things. A school of Jutt Jaw fish also joined in the fun and to see such a big school was very uncommon. 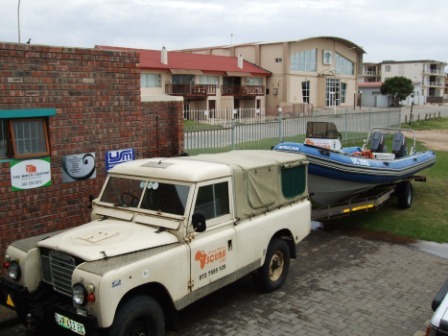 On Saturday we did our very first double tank dives to St Francis. Overcast and raining but determined to dive those reefs having waited so long to do so. On our way there a whale and her calf were playing in the bay opposite Paradys. Splashing with their tails and reminding us of their power. As the rains hit we still had about 3km to go before our first dive. 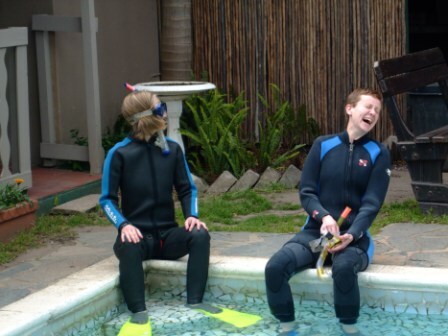 On Saturday 22 Oct we had two PADI Discover Scuba Diving sessions at the Savoy hotel. Some were very nervous to go underwater but as they got used to the feeling of breathing underwater it was more difficult to get them out the water. All 4 of them also decided to do an ocean dive on Sunday morning.